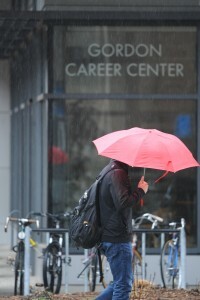 The Gordon Career Center at Wesleyan University. The Gordon Career Center (GCC) recently began a new collaboration with HBX—Harvard Business School’s CORe (Credential of Readiness Program), an online business fundamentals primer developed and taught by Harvard Business School faculty. Wesleyan students looking to gain basic business fundamentals can complete the program over the summer—in some cases, on the side with a summer job or internship. According to Rachel Munafo, the GCC’s assistant director of public relations and communications, several alumni who have completed the program raved about its usefulness. The curriculum is appropriate for students across all majors, and is open to underclassmen, graduating seniors and recent graduates. The program covers three essential business topics: business analytics, economics for managers and financial accounting. Participants spend approximately 150 hours over the course of eight to 18 weeks to complete the program. Courses stress real-world problem solving using a variety of custom-developed cases, and feature multimedia and interactive teaching elements. Participants engage with teachers and learn through collaboration with a cohort of peers. Financial aid for the program is available through Harvard, and Wesleyan will pay the remaining cost for high-needs students, said Munafo. Upcoming classes begin May 17 and June 7. Learn more and apply at hbx.hbs.edu/core.